Every year the Department of Communication is astounded by the great accomplishments of the undergraduate students, many of whom are part of the UConn Communication Society. The Comm Society is an organization that allows students interested in Communication to network, explore future opportunities, and learn more about the subject as a whole. This year, the Comm Society is being lead by president Julie Pyrcz. Julie is an outstanding member of the Communication Society, as well as a well-rounded student. She decided upon becoming a comm major because she loves listening and talking to people, and she also enjoys writing. Post graduation, Julie hopes to work in corporate communications, potentially in the area of Corporate Social Responsibility. She stated that she doesn’t know where she’ll end up, but her education from the Department of Communication has prepared her to excel in any opportunity that comes her way! 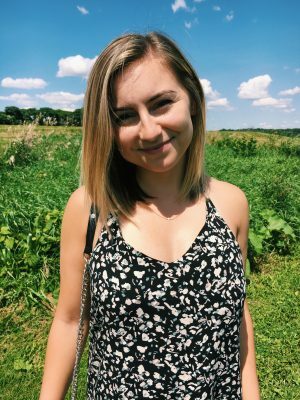 Over the course of her years at UConn, she stated that her favorite class this far has been Interpersonal Communication (COMM 3200) with Professor Amanda Denes. As one of her first upper level courses, she found it interesting because she learned an abundance of things that she could apply to how she communicates in her everyday interactions. Along with Professor Denes, she admires Professor Rory McGloin and Professor Shardé Davis. Julie stated that after working closely with Professor McGloin in the Comm Society, she has found that he truly cares about his students, and wants them to succeed both in and out of the classroom. She also stated that Professor Davis brings unparalleled enthusiasm to class every single day and never fails to get her students excited about and interested in a topic. Outside of the classroom, Julie has gained a lot of her experience through internships. She received her first internship during her freshman year where she ran an ice cream shop’s social media. That lead her to a bigger role as an intern with Pratt & Whitney. For the past ten months she has been creating social media content, producing videos, planning events, writing articles and developing strategic communication campaigns for P&W. Julie feels that her internship experience thus far has been invaluable to her journey into becoming a seasoned communication professional, and she has learned more than she ever thought she could in the process. Julie is one of the many students the Department of Communications feels goes above and beyond what is asked of them to excel as communication professionals. She strives to make COMM Society “a great resource for students to learn more about communications careers and network with other communication students. This club is a great opportunity to build your network and communication skills to prepare you for after graduation.” Her devotion to the Communication Society and internship shows that she has what it takes to succeed post graduation. 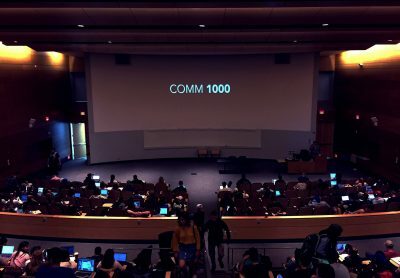 Hundreds of students, all with different majors and interests, file into lecture halls during the week to attend The Process of Communication (COMM 1000). For some students this class is their first step into a career in the field of communication, and for others it is a course where they learn the skills they need to succeed in business, engineering, and any other career path they may choose to pursue. The objective of this course is to show students the role of human communication and its influence in everyday life while familiarizing them with both verbal and nonverbal communication across interpersonal, media, and new technology formats. The course is unique because it allows students to learn through creative projects such as a photography project, as well as the creation of a 15 second short film. For the photography project he asks students to take pictures that represent their experience as a UConn student. The 15 second film project allows students that are accustomed to a large lecture hall to get in small groups and create a narrative in a 15 second video. The projects allow students to apply what they have learned about communication through storytelling. The intro course is designed for students of every major. Course supervisor Stephen Stifano P.h.D. stated that, “If there’s one skill that will improve your prospects in any other field, it is being able to communicate effectively with a variety of people in a variety of contexts”. Although only an introductory course, the COMM 1000 curriculum goes above and beyond the base information of the subject. It teaches people how to apply communication to their lives and allows them to see where effective communication will bring them in the future. Humans are constantly communicating, and the basis to succeeding in any job is effective communication skills. Professor Stifano combines theory with tasks that students need to do every day, whether it be properly writing emails, or how to present yourself in a positive light online. So much of what is studied in communication applies to the everyday actions of a college student. Stifano strives to have every student realize that there is more to their day to day interactions than it seems on the surface, and he hopes that the students will be more mindful of the messages that people provide them with, which is critical to the everyday world. This course is not only recognized in the department as an inspiring and important course, during the 2016-2017 school year, COMM 1000 won the NCA Basic Course Program of Distinction award. This award is given to courses that serve as best practice models for other departments when designing their basic courses. In the future, Stifano stated that the course will be adapted to allow students to continue to be challenged as the course gets increasingly focused on media and technology as they infiltrate our everyday interactions.